The presentation will be on Wednesday, Sept. 14 from 12 pm – 1 pm in the Student Union Building (SUB) on Main Campus in the Cherry/Silver room. 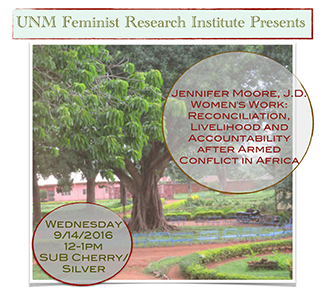 The working title of her manuscript is Transformation After Violence: Justice, Gender, and Civil Society in Africa. Her goal is to explore the perspectives of women engaged in grassroots peacebuilding activities in Uganda, Sierra Leone and Burundi, now a decade or more since the peace agreements were negotiated at the national level in each country. Her data gathering occurs through interviews with non-elite women in rural villages. After explaining her research and seeking informed consent, she invites her interviewees to define and describe their understandings of the concepts of reconciliation, livelihood and accountability from their own perspectives and experiences. She will be speaking about the first two phases of her research in Sierra Leone (March 2016 and forthcoming December 2016) and Uganda (July 2016). Moore's book project entails her first attempt to incorporate systematic qualitative research into her legal scholarship on human rights and humanitarian law and she values feedback. She believes that international legal scholars have much to learn from anthropologists, political scientists and scholars working in other kindred disciplines.